We have been enjoying what will likely be the longest period of economic expansion ever for the country. Corporate earnings have been resilient, consumer and bank leverage has been contained, and labor productivity has been high while inflation kept low. This has been in no small part due to the Fed putting significant muscle behind the economy to move it forward from the 2008 financial crisis, slashing interest rates from over 5% down to zero and buying Treasuries and mortgage backed securities to provide market liquidity and support. Furthermore, the Trump administration’s more recent deregulation and tax reforms had turbocharged an already strong economy. Thus, the U.S. has been a standout performer versus other developed and emerging economies. The final quarter of 2018 was the worst quarterly performance for the US stock market since Q3 2011, largely due to an abysmal December – the worst since 1970. Market volatility came roaring back in the fourth quarter with a variety of economic and political factors contributing to the turbulence. Our Q4 Market Webcast focuses on what happened in the markets through December and how we are thinking about them going forward. Please watch the recording for key insights from our CIO Chris Moore. As we entered 2018, equities rallied with vigor in January, however we began to see a wider distribution of returns across markets. The first salvo of a trade war with China was made in February and catalyzed domestic and international equity dispersion, further fueled by a strengthening dollar as investors rightfully viewed the US’ domestic growth, rising rates, and now protectionist measures, as an attractive market to be allocating capital to. We would note that “growth” stocks performed well but the continued rise in rates weighed on slower growing “value” stocks, as they were viewed to be more rate sensitive and subject to inflation. 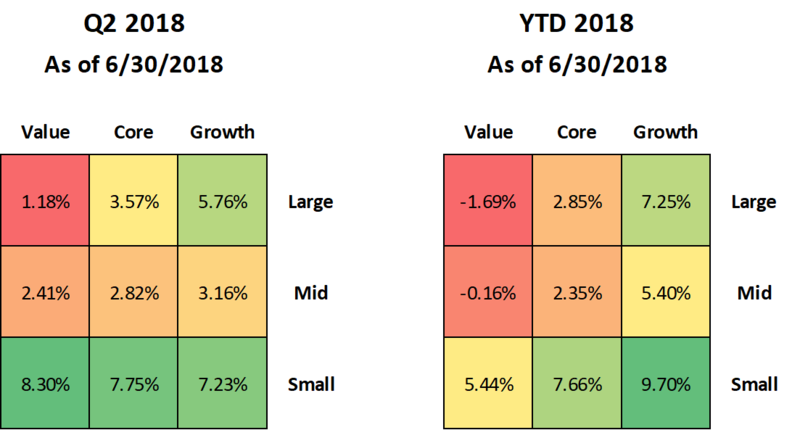 Through all this, investors leaning into domestic high-multiple growth equities and away from more defensive fixed income assets looked like heroes through most of 2018. Our Chief Investment Officer, Chris Moore reviews the market environment during the third quarter of 2018. After a relaxing summer of benign markets and domestic equity indices setting new highs, volatility came back with a vengeance in October, and with less than a week left in the month, has taken away practically all the gains made so far this year. As of the time of this writing, the S&P 500 is down almost 9% on the month, taking the index negative year-to-date. It’s worth noting is that the leaders for the first three quarters of the year, Tech and Small Caps, are underperforming meaningfully so far in October, with the Nasdaq and Russell 2000 indices down 12% and 13.4%, respectively. The domestic economy and stocks showed their resiliency in the second quarter, with GDP expanding over 4% and the S&P500 returning over 3%. Equities are up over 5% from the February lows. Market skittishness has also eased to a more relaxed summer level with the VIX trading in the low- to mid-teens despite continued trade war tensions and concerns of an over-heated and over-extended business cycle. Corporate earnings and business fundamentals show further strength, and investors are basking in the moment. We remain generally sanguine on the economy, which should be supportive for stocks, however we take opportunities like this to narrow our areas of focus rather than leaning into the rally.